Rapulana Seiphemo. Robert Hobbs. Jeffrey Zekele. Ronnie Nyakale. Shelley Meskin. Jafta Mamabolo. Motlatsi Mahloko. Kenneth Nkosi . Drama. Gangster/Mob. Robberies Burglaries Heists. Violence. Police. 1990s. 2000s. Guns. Chases; Cars, buses, etc. Black Interest. 01 Nigel's Choice. Recommended. A decade on an we see him as a struggling taxi-driver before his transformation into a businessman who uses violence to reclaim inner-city Joburg tenement blocks from the drug-dealers and hookers who inhabit them and from the rich white slum landlords who own them. Thus the ambitious gangster realises an aim of the revolution - decent homes for poor blacks - and fulfils his own personal wealth ambitions. 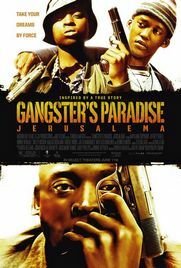 The film is a tight and sometimes funny (eg a car-jacking going wrong when neither of them knows how to drive) gangster movie, whilst remaining ambivalent about the corruption and brutality that can accompany revolutionary gains. NB the opening segment of the film, Lucky as a teenager, is subtitled but the main segment is in English.